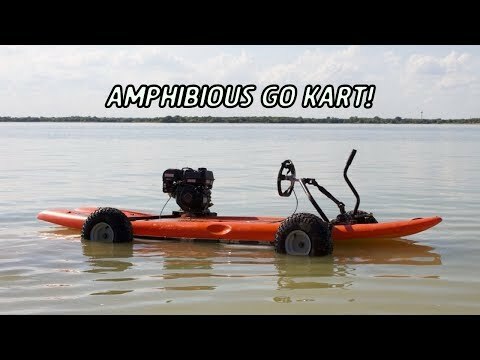 In this video we build a completely functioning amphibious go cart! This was a really build and what the plan really was is to make a driving paddle board and make it a floating go kart that we could drive on land as well as in the water! Some of the challenges we faced was making the frame completely surround the board without crushing it or poking a hole in it because it had to be sealed to hold water. Once we mounted the engine and the centripetal clutch above the board and ran a chain under the frame we were ready to test it! For the brakes we installed a go power sports drum brake and a brake lever and they worked great! After we had all of these drivetrain parts installed we had to focus on steering. We mounted the steering above the board and made it completely isolated from the kart so it wouldn't get wet or damaged. After all the systems we done we mounted some all terrain tires and took it for a water bound test at Lake Lewisville and it was a complete success! This was a really cool homemade amphibious vehicle and we are excited to see what this amphibious car can do! Thank you guys for watching and be sure to stay tuned for when this thing gets an outboard motor and takes on Lake Texoma!